Of Hotel Jantar Mantar and Irom Sharmila’s Prison Cell! The photograph tells an interesting tale. A far more interesting one in fact, than those in the photograph would want. It has everything that upwardly mobile Indian middle classes would want: two self-assured men stealing a well deserved rest from whatever they were engaged in with their doting wives in attendance. As clichéd, as it can get, the picture has a 'feel' to it. It has a feel of a family, of old friends' reunion, of a thrilling and adventurous escape from the humdrum of everyday life. It's just that the picture is not from a family album. It was not clicked on a lazy Sunday spent in the wild. Quite on the contrary, it was taken at Jantar Mantar, the capital of all 'democratic' and non-violent protests in the country. The men in it are not merely looking self-assured, they actually are. They have made it big. So big that they can afford to pick and chose what to take on and when to let it go. They take, for example, the smallest of the accusations against any leader of the United Progressive Alliance, particularly those from Congress, rather seriously, and fill all those television screens with their angry screams. They decide to leave alone, on the other hand, the gravest of the graft charges against leaders of the Bhartiya Janta Party. Their lists of 'corrupt' ministers miraculously manage to leave the likes of Bookanakere Siddalingappa Yeddyurappa and the infamous Reddy Brothers out. Corruption has got a colour, you know. And for them, it can be anything but saffron. How they get away with this, one might ask. The answer is rather simple. They lie about their non-partisanship. They lie about it so many times that people start forgetting that these are lies. Noone has an idea if they actually subscribe to this ideology as well or not, though there are enough reasons to suspect that they do but their belief in the efficacy of the Goebellesian propaganda apparatus is beyond doubt. They get away with even this because they are not nobodies, not mango people as nobodies are often referred to. They are big ones, self-designated voice of the Indian nation. And mind it; a few thousand actually listen to them. They are Arvind Kejriwal, a bureaucrat who went on a fully paid study leave and never returned to his work, and Manish Sisodia a journalist turned social activist. 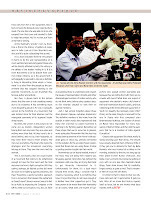 They are riding high on their image as core members of Team Anna. Amusingly, the irony of running a supposedly popular movement in the name of an individual seems to be lost on them and the few thousand who listen to them. They truly believe that this individual, a self-proclaimed Gandhian who not only believes in public flogging being the correct sentence for rule (and not the law of the land) breakers, and actually implements it in his village, is the living articulation of the aspirations of Indian masses. Needless to say, their idea of India and its people does not take into account millions of those whose lives are haunted by hunger. They seem to be completely oblivious to the existence even of more than hundred thousand peasants of our country who were compelled to commit suicide because of the deepening agricultural crisis. They do not appear to be aware of easily curable diseases like Japanese Encephalitis and gastrointestinal ailments claiming thousands of our children every year. They are nothing less than modern-day Arjuna, that mythical character of Mahabharata who trained his eyes to see nothing else but his target. All they seem to be bothered with is corruption, that too the one at the higher echelons that troubles big corporations that fund them and their movement. Ask them if that corruption is linked to and sustained by social institutions or not, and all one gets is a shrug and a counter allegation of being a stooge of the corrupt. 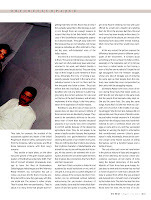 Ask them if corruption can be eliminated without radically restructuring the pre-modern structures of caste, kinship, clans and the hierarchical distribution of land and power in society, and they get Anna Hazare breaking his fast with juice offered by a Dalit and a Muslim girl, labeling them for life in the process. But then, this and much more has been already written about.So let us go back to the picture, as it reveals a few fascinating facts about their mental makeup. Much more than what they would have wanted. At the very outset, the picture exposes the differential treatment given to different participants of the 'movement'. It screams aloud something until now unheard in Indian politics, especially in the resistance part of it. Did one ever hear a radical leader on fast having a room of his/her own to retire to? Forget the old age satyagrahis from the freedom struggle, whose very idea of struggle was of enduring the same pain as their people. Even the relatively new leadership never compromised on their unity with the struggling masses. 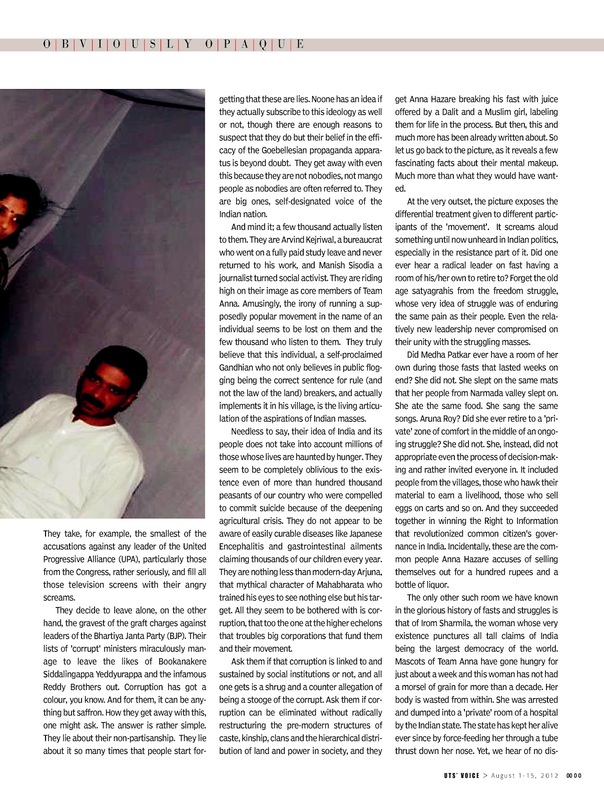 Did Medha Patkar ever have a room of her own during those fasts that lasted weeks on end? She did not. She slept on the same mats that her people from Narmada valley slept on. She ate the same food. She sang the same songs. Aruna Roy? Did she ever retire to a 'private' zone of comfort in the middle of an ongoing struggle? She did not. She, instead, did not appropriate even the process of decision-making and rather invited everyone in. It included people from the villages, those who hawk their material to earn a livelihood, those who sell eggs on carts and so on. And they succeeded together in winning the Right to Information that revolutionized common citizen's governance in India. Incidentally, these are the common people Anna Hazare accuses of selling themselves out for a hundred rupees and a bottle of liquor. The only other such room we have known in the glorious history of fasts and struggles is that of Irom Sharmila, the woman whose very existence punctures all tall claims of India being the largest democracy of the world. Mascots of Team Anna have gone hungry for just about a week and this woman has not had a morsel of grain for more than a decade. Her body is wasted from within. She was arrested and dumped into a 'private' room of a hospital by the Indian state. The state has kept her alive ever since by force-feeding her through a tube thrust down her nose. Yet, we hear of no distress calls from her or her supporters. She, in fact, removes the tubes at every opportunity to resist. The one time she was able to do so, she escaped from that room and traveled to Delhi to lodge her protest. Yet, it's not her, but Team Anna that is sinking. 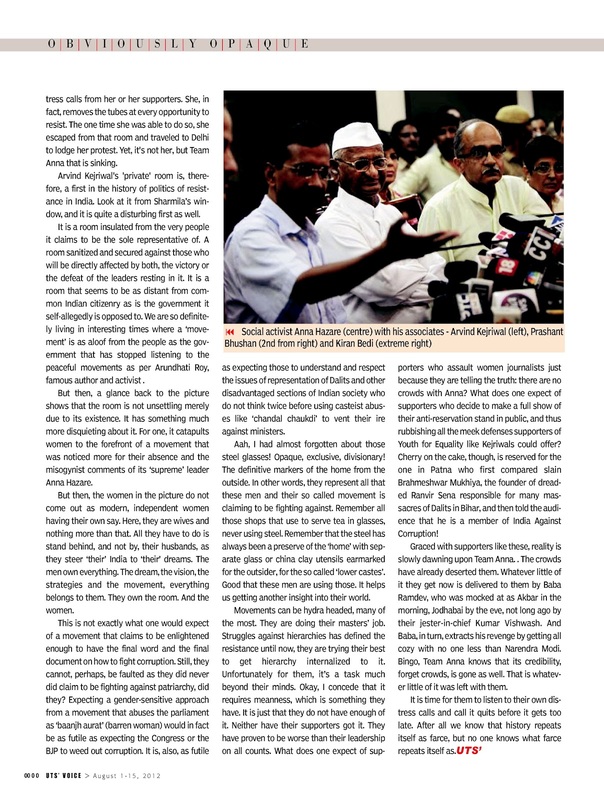 Arvind Kejriwal's 'private' room is, therefore, a first in the history of politics of resistance in India. Look at it from Sharmila’s window, and it is quite a disturbing first as well. It is a room insulated from the very people it claims to be the sole representative of. A room sanitized and secured against those who will be directly affected by both, the victory or the defeat of the leaders resting in it. It is a room that seems to be as distant from common Indian citizenry as is the government it self-allegedly is opposed to. We are so definitely living in interesting times where a ‘movement’ is as aloof from the people as the government that has stopped listening to the peaceful movements as per Arundhati Roy, famous author and activist. But then, a glance back to the picture shows that the room is not unsettling merely due to its existence. It has something much more disquieting about it. For one, it catapults women to the forefront of a movement that was noticed more for their absence and the misogynist comments of its ‘supreme’ leader Anna Hazare. But then, the women in the picture do not come out as modern, independent women having their own say. Here, they are wives and nothing more than that. All they have to do is stand behind, and not by, their husbands, as they steer ‘their’ India to ‘their’ dreams. The men own everything. The dream, the vision, the strategies and the movement, everything belongs to them. They own the room. And the women. This is not exactly what one would expect of a movement that claims to be enlightened enough to have the final word and the final document on how to fight corruption. Still, they cannot, perhaps, be faulted as they did never did claim to be fighting against patriarchy, did they? Expecting a gender-sensitive approach from a movement that abuses the parliament as ‘baanjh aurat’ (barren woman) would in fact be as futile as expecting the Congress or the BJP to weed out corruption. It is, also, as futile as expecting those to understand and respect the issues of representation of Dalits and other disadvantaged sections of Indian society who do not think twice before using casteist abuses like ‘chandal chaukdi’ to vent their ire against ministers. Aah, I had almost forgotten about those steel glasses! Opaque, exclusive, divisionary! The definitive markers of the home from the outside. In other words, they represent all that these men and their so called movement is claiming to be fighting against. Remember all those shops that use to serve tea in glasses, never using steel. Remember that the steel has always been a preserve of the ‘home’ with separate glass or china clay utensils earmarked for the outsider, for the so called ‘lower castes’. Good that these men are using those. It helps us getting another insight into their world. They are doing their masters’ job. Struggles against hierarchies has defined the resistance until now, they are trying their best to get hierarchy internalized to it. Unfortunately for them, it’s a task much beyond their minds. Okay, I concede that it requires meanness, which is something they have. It is just that they do not have enough of it. Neither have their supporters got it. They have proven to be worse than their leadership on all counts. What does one expect of supporters who assault women journalists just because they are telling the truth: there are no crowds with Anna? What does one expect of supporters who decide to make a full show of their anti-reservation stand in public, and thus rubbishing all the meek defenses supporters of Youth for Equality like Kejriwals could offer? Cherry on the cake, though, is reserved for the one in Patna who first compared slain Brahmeshwar Mukhiya, the founder of dreaded Ranvir Sena responsible for many massacres of Dalits in Bihar, and then told the audience that he is a member of India against Corruption. It is time for them to listen to their own distress calls and call it quits before it gets too late. After all we know that history repeats itself as farce, but no one knows what farce repeats itself as.